With innovative multi-genre original productions, sensational interpretations of modern classics, and an “exhilarating blend of precision and anarchy, rigor and bedlam,” (New Yorker), Sō Percussion has redefined the scope and vital role of the modern percussion ensemble. When the Prism Quartet decided to commission a body of work built around the idea of musical colors, it seemed a natural next step for a group that has already created a substantial and diverse repertoire fo music built around the almost infinitely variable sounds of the saxophone family. The sax has a long tradition in classical music, and rock, and even South Indian music; but its most famous players have been jazz musicians - from Coleman Hawkins to Charlie Parker to John Coltrane - whose sound was built around the so-called "blue" notes that are part of the fabric of jazz. So the members of the quartet had a deep connection with the idea of tone colors. But that wasn't the Color Theory moment of genius. No, that came when Prism decided to ask composers Steven Mackey, Ken Ueno, and Stratis Minakakis to write for the combination of saxophone quartet and percussion. There is no more kaleidoscopic palette in the instrumental world than in the percussion section - where over the years composers have placed such sonic oddities as bird calls, a record player, automobile parts, and the piano. Color Theory pairs Prism with two percussion-based ensembles: So Percussion, the New York-based quartet whose definition of "percussion" is liberal enough to include teacups, twigs, and fuzz; and Partch, the California-based ensemble that plays mid-20th century instruments designed by Harry Partch, whose 42-note-to-the-octave tuning system operates with a completely different sonic palette. 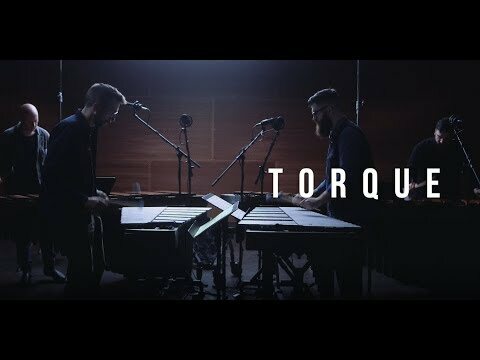 "This is a group that clearly inspires composers to push the limits of what’s possible, and the four performers — Eric Cha-Beach, Josh Quillen, Adam Sliwinski and Jason Treuting — just as obviously relish challenges both rhythmic and theatrical.... What So Percussion has, at least to some extent, is a house style, one built on roiling, atmospheric textures punctuated at times with offbeat interjections."